i am in the city often and love when i come across the “pop-up” stores… the sample sales that are there for just one day, sometimes if you’re lucky 2. but it is a spontaneous event. 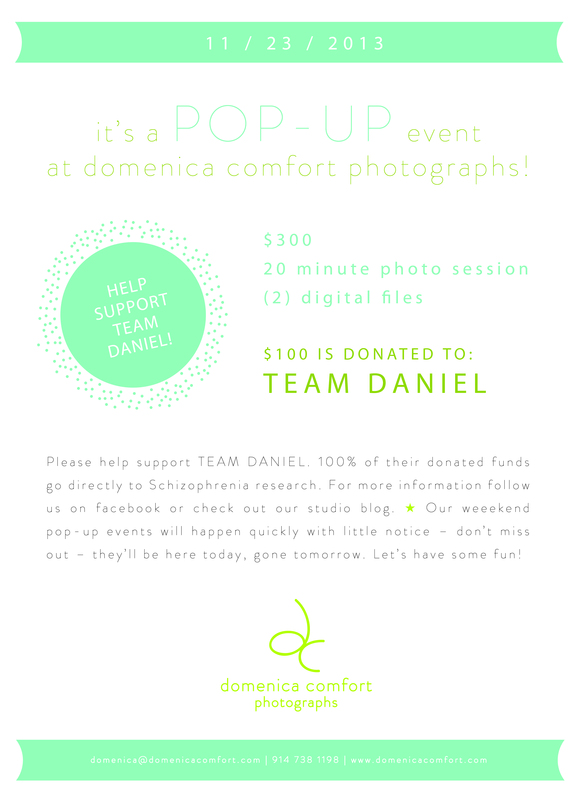 i thought what a great concept to create as a fundraiser for TEAM DANIEL. 100% of donations go directly to schizophrenia research. Event Info: saturday, 11/23/2013 from 10-4pm . the $300 ($100 which will go to TeamDaniel) is for a 20 minute photo sessions in the studio on a white background and includes 2 high resolution digital files perfect for holiday cards. i am best friends with daniel’s family and his journey is one of success and one to celebrate. diagnosed in his teens with schizophrenia, and after many different protocols, he is doing great! daniel is proof the clozapine protocol is an effective treatment. daniel’s family is committed to helping others have access to this protocol, as well as remove the stigma associated with schizophrenia. daniel is now a senior at SUNY purchase (boards there during the week), has his own radio talk show at SUNY and does stand up comedy in NYC (and the shows i’ve gone to, he’s been the best!). this january, i will be part of TeamDaniel at the Disney 1/2 marathon and will be running/walking with daniel, his family and other supporters. His father, Rob, has completed 60 marathons (14 Boston Marathons) and runs with daniel in the 1/2 marathon and the full marathon the next day. through running, daniel is able to maintain a healthy weight to prevent one of the side effects from the drugs. unfortunately much of the violence that is being committed is directly related to mental health and everyone deserves to live a productive life in a supportive community.